If you have to - or if you want to - use a lightweight web browser you have to be ready to live without support for Java, Flash, and even cascading style sheets. Your old computer did not support Java or Flash a decade ago, and you just cannot expect to have all the modernities if you are using a very old computer, let us say with less than 64 MB RAM. If you have more memory, consider using for example Opera. 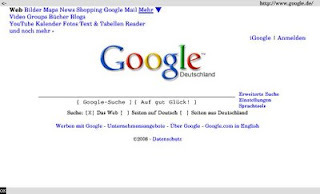 There are several lightweight and minimalistic browsers available. Some of them can be used only in text mode. Lynx is one of them. Lynx was originally written for Unix and VMS, It is available for many platforms, including DOS, BeOS, MINIX, QNX, AmigaOS and OS/2. I use it daily when following links in the emails I receive, as I have configured my email client pine to use lynx as web browser. w3m is another text mode browser. It has English and Japanese help files and it can be used in both languages. w3m can display tables and frames. In addition, it can be used in pipes as a pager, just like more or less are used. 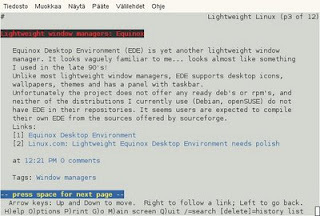 Links is a text mode WWW browser with ncurses interface. It supports colors, tables and background dowloads. Frames are supported as well. It is configured by menus. Links can be used not only in text mode, but also in graphical mode by starting it with option -g. It might be good enough for simple graphical pages. Elinks is based on links. It is a text mode WWW browser, supporting colors, table rendering, background downloading, menu driven configuration interface and tabbed browsing. The official home page for elinks has more screenshots! Last but not least: Dillo. I suppose Dillo is the lightest graphical web browser. It is pretty simple and unfortunately its development has been frozen. 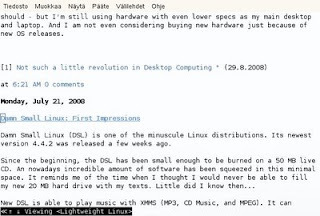 Enclosed screenshot is borrowed from Dillo's home page, as Dillo has already been left out from openSUSE's repositories. As for really old stuff, you can also look at ye olde Arachne GPL web browser. I have yet to get it working, but supposedly the GUI part works pretty well (I even saw a demo of it on an 80286 with 4MB RAM). "Warning: Arachne for Linux is very early and experimental. It is called "alpha release" because it is definitely not ready for end users. Distribution package for Linux includes binaries for i386 platform. Package is in very early phase of development, but it can already launch mpg123 as background player of MP3 files and streams." links2 -- Links is a graphics and text mode WWW browser, similar to Lynx. links -- Links is a text mode WWW browser, similar to Lynx. I'm not sure what to make of there being two packages instead of just a switch in one, but figured I'd share the info in case it spares others confusion in the future.